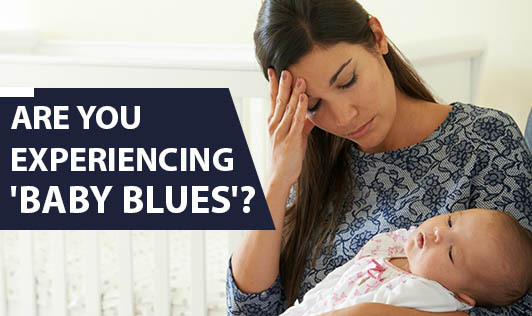 Are you experiencing 'Baby blues'? You have just had a cute little baby which you have long awaited for and everyone except you is excited. Wondered why? Child birth is a stressful process and having ‘baby blues' is quiet common. It is usually seen within a few days of child birth and may last up to 15 days after delivery. Experts say the major cause is due to hormonal changes brought about by child birth and milk secretion combined with physical, mental and emotional exhaustion and also due to sleep deprivation typical of parenting a newborn. The new mother would become moody, sad, and irritable; have lack of concentration, low appetite and difficulty to sleep. • Take a break and pamper yourself well by having a bubble bath, a quick pedicure or enjoy your tea which surely would relax your mind and make you feel fresh. • Do not expect too much from yourself when it comes to taking care of your baby. You will learn it with time. But be positive. • Make sure you are not alone. Household chores may be easier with help from your partner, relatives and friends. • Have healthy snacks. Do not ignore your health while taking care of your newborn. • Go for a small walk which would help you divert your mind and make you feel fresh. • Share your feelings with your partner or any other person you are comfortable with so that you feel relaxed and you know that person will be around in case you need any help. Enjoy your new motherhood, another phase in life which you are fortunate to have got. Embrace it with open arms. Smile and face the challenges that your long awaited little one gives you with a positive attitude and you are bound to succeed with it.